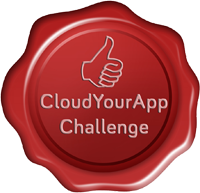 We have mustered the courage to put up this challenge to illustrate our confidence about CloudYourApp and its business value to our customers. We are quite eager to know if there is any provider across globe who can offer cloud servers packed with features and costs reasonably compared to what we offer. If anyone fulfils this challenge, we are more than happy to see how we can become further better. We have laid some terms and conditions for this challenge to make sure it’s all fair play at both sides. CloudYourApp has 19 unique & major features, the compared provider should offer at least 16 features. The cost of the equivalent service should not exceed 125% of what CloudYourApp offers. The compared provider should have been in the market for at least 2 years and the offer should have current validity. None of the CYA team members, CYA partners, CYA authorized resellers can participate in this challenge. The reward is applicable only if the challenge is fulfilled, satisfying all the criteria mentioned above. CYA team reserves the sole discretion to evaluate and approve the claim for the challenge. The reward comprises of one CloudYourApp server (any other supporting services are not included as part of the reward) of any available configuration and any duration provided the published CYA price of the chosen CYA Server does not exceed a total of 500 CVP. The contender should NOT use the same provider who has already won the challenge (if any). The reward will not be provided in any form of money or its equivalent. The same contender cannot apply for claiming the challenge more than once, immaterial of whether the first claim was approved or rejected.